After living in Japan for a while, you start to experience something that I like to call the ‘hello-you’re-in-japan-face-slap’. I have talked about it in previous posts. It means that you have gradually gotten used to all the wonderful Japanese things that excited you so much at first. Life in Japan has started to seem so normal. But even then, from time to time, you will experience something that really makes you feel like you are in Japan. Like that time I ran into a monk in a fabric store. The excitement I feel at such a time, is the reason I call it ‘a face-slap-moment’. 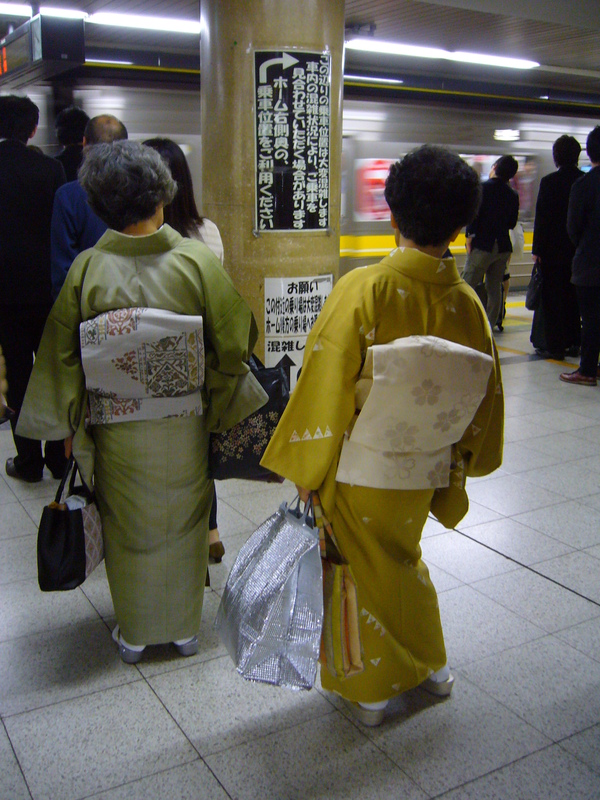 Another good example of a face-slap-moment is seeing ladies in kimono on the train. 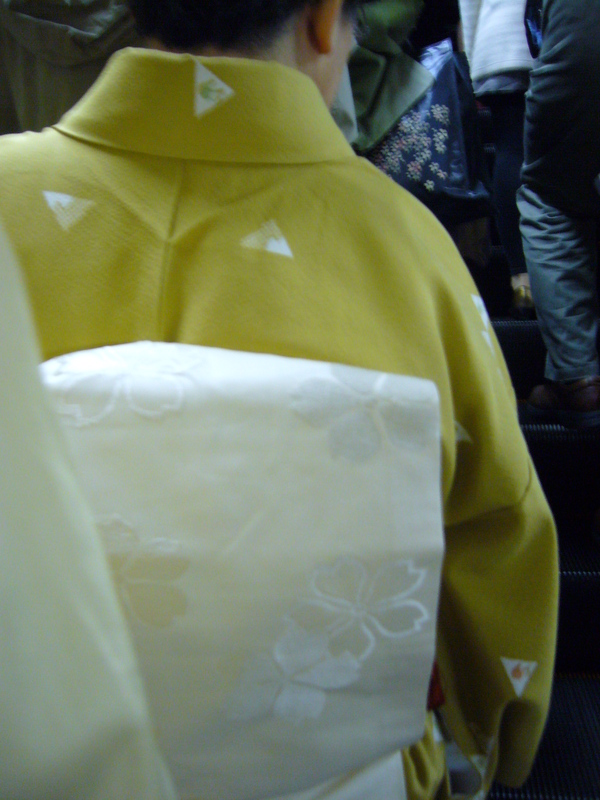 Even towards the end of my year in Japan, I still felt really excited whenever I saw someone in kimono. Apart from the summer festivals, you really don’t see that many people in kimono anymore (with the possible exception of Kyoto). 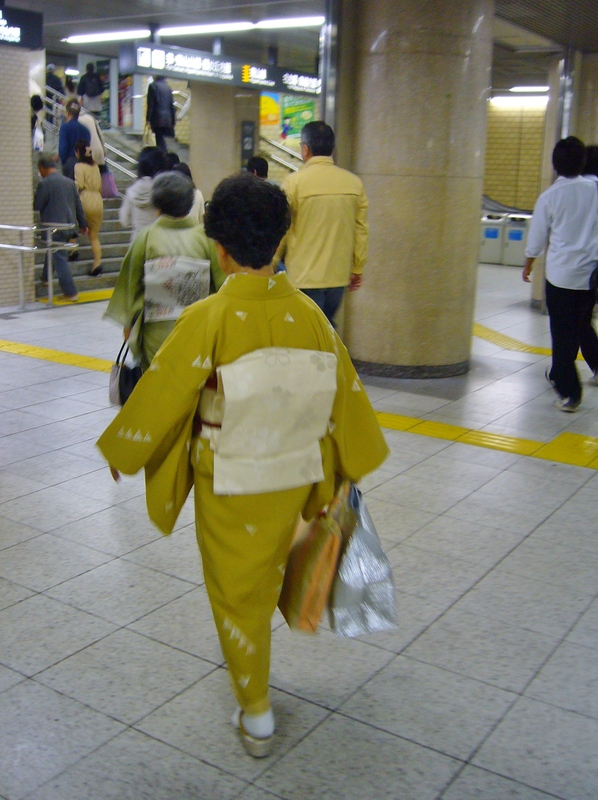 It is very hard to wear kimono and many young people don’t know how to do it. 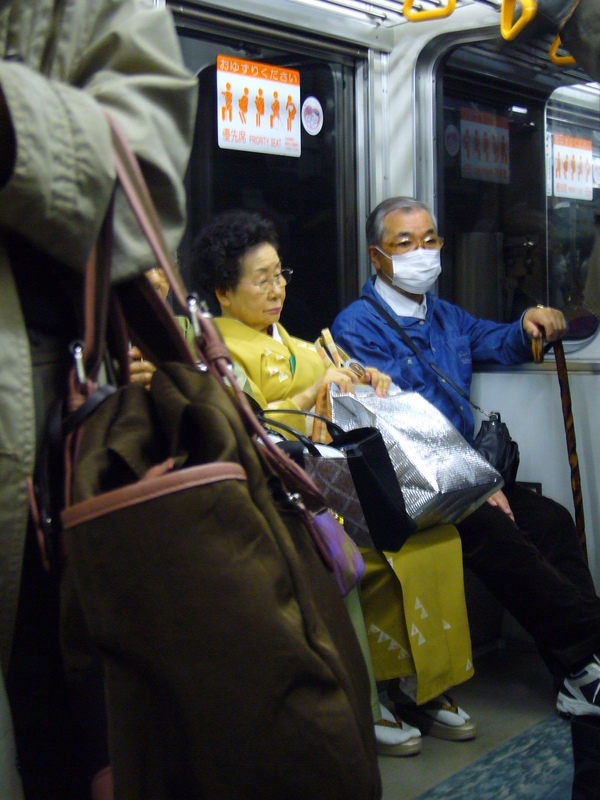 If you see someone in kimono, it is usually an elderly person. Ladies in kimono on the train in Japan. If you look closely, you will see the slightest hint of a green kimono, to the left of the lady in the yellow kimono. Lucky for me, these ladies took the same transfer that I did. This gave me the perfect opportunity to follow them throughout Fushimi station in Nagoya and keep taking sneak photographs. On the escalator I managed to get a close-up of the obi and the kimono fabric. People probably thought I was crazy taking all these photographs. Or maybe they just thought “*sigh* foreigners…”. Fortunately, Japanese people are too polite to comment on it. Escalator close-up of the lady in the green kimono. She was standing a bit farther away from me. My best photo opportunity came at the end, when they finally stood still, waiting for the next train. Aren’t they lovely? The posture of the lady in yellow is so elegant and the kimono are gorgeous! This entry was posted in Culture, Fashion, Japan, People watching and tagged Clothing, Fashion, In the streets, Japanese culture, Kimono, People watching, Traditional Japan, Train by Haruko-chan. Bookmark the permalink. those kimonos are very nice indeed. i heard they worth so much money that most people in japan now a days can’t be bother to buy one. It depends on the kind of kimono. Maybe these kimono in the pictures are not the really expensive ones but more like kimono for casual use. It is possible to find a nice, normal kimono for 10000 yen, or even less if you are lucky. But if you see the kimono people wear at weddings for example, the black ones with elaborate embroidery, those are very expensive. But it is not only the price that is keeping people from using kimono nowadays. They are a lot more difficult to put on than Western clothes and you move less freely in them. You also need a lot of material to keep everything in place. And then you need to buy the obi (big sash) and all the accesories (ribbons above and around the obi, and undergarnment and socks and shoes). The cleaning of silk kimono is also very expensive. To have one silk kimono dry cleaned can easily cost 10000 yen. So to wear kimono really is like something of a lifestyle choice. definitely sounds more of a fashion choice for the rich. I recently found out that a lady nurse who used to work in our company nowadays wears kimono almost everyday. I saw her a few months ago and sure enough she was in a kimono which made her seem more elegant and graceful though I remember her as a very outgoing tomboy type. I took some classes together with a Japanese friend who also didn’t know how to wear kimono. After 8 classes of 2 hours each, we can manage a regular kimono and a nagoya obi drum bow (taikomusubi). Altough it takes some investment to learn, it is so much fun to do! And the result is so beautiful! I highly recommend it. I totally agree and perhaps I would learn to wear one someday. My mother has a very elegant kimono that I would one day love to inherit so maybe before I do, I should start learning! Sometimes I see people in kimono on trains (and occasionally buses) as well, but like you, the vast majority are either girls and young women dressed in yukata for a festival, or elderly ladies seemingly just going about their business as usual. I have yet to see any men in kimono on public transport at all. Good point about the men. I am trying to remember now if I ever saw any men in kimono on the train. 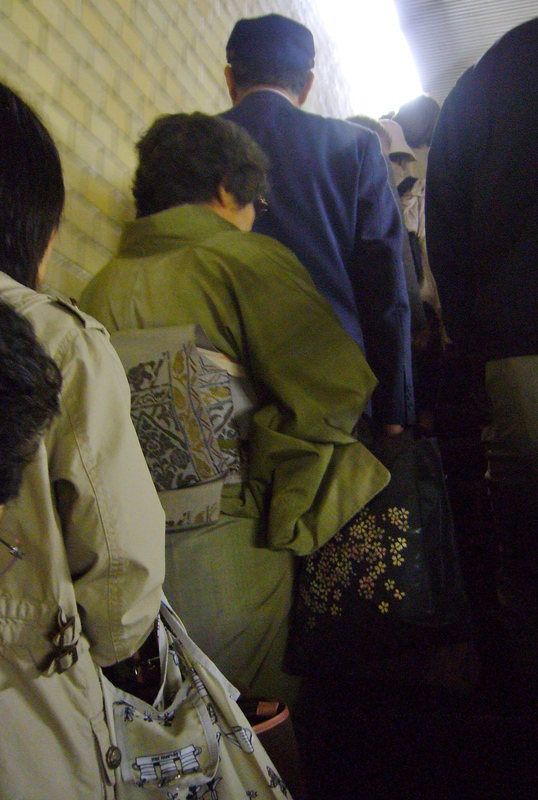 Once I saw a sumo wrestler on the train during the Nagoya Tournament, and they have to wear kimono every day. But other than that, I don’t think I ever saw any.